Dow up by 80-something points. A barrel of the world’s currently-preferred energy sits pretty at $100, on the nose. Nothing much, in other words. Gold prices climbed Thursday to levels last seen in early December, extending a rally triggered as the Federal Reserve pledged to hold US interest rates near zero until the end of 2014. Gold for February delivery, having risen almost $25 yesterday on the news, now fetches $1,725 an ounce. And this, just when investors had begun to abandon the barbarous relic, to question its motives. But that was their mistake. Gold may go up. It may go down. But it has no motives. It is no man’s liability. Instead, it simply holds a mirror up to its government-issued competition. It is, itself, just a dumb lump of metal. But even so…it frequently appears the brighter, smarter choice — in relative terms — to the buffoons in the mirror. America’s #1 central banker may well be highly intelligent…but that does not preclude him from also being a dunce. Probably, it depends on the subject at hand. Maybe he’s a talented cowboy, for example. Or perhaps he is a whizz at the Times’ crossword. Either way, we wish he’d dedicate more of his time to words and herds because, as a central banker, he’s either a fool, a knave…or both. And now, despite all evidence to the contrary, Mr. Bernanke thinks he can pull the economy out of the very mess into which he helped to steer it. He thinks he can deliver prosperity to a nation by punishing savers and inducing malinvestment — gross capital misallocation — on a scale so grand that die-hard proponents of Social (In)Security must be starting to blush. Bernanke’s commitment to holding interest rates “exceptionally low” for an “extended period,” reeks of exactly the kind of insanity required to double down on a bad bet, of repeating the same experiment and expecting a different result. Combined with his “relapse into QE3, Euro-style,” which Eric Fry highlighted in yesterday’s issue “Gentlemen, Start Your Printing Presses!”, dollar-holders (and metal holders) ought to expect more of the same. Imagine someone’s whole existence, his entire life’s work, is somehow built on a false grasp of reality, a radically skewed first principle. Imagine, for example, he is an internationally respected professor of alchemy. Or a world renowned proponent of the “stalk theory” of conception. Or…a central banker who believes he can know the impossible…the minds, the desires and the needs, of the millions who make up the market over which he imagines himself to lord. For a while, luck, coincidence and the arc of history appear to be on his side. As his life goes along, our hapless hero is awarded greater and greater accolades for his misbegotten theories and crackpot ideas. He is gifted the highest seat in the land. The adoration of friends and peers. TIME Magazine’s “Man of the Year.” Eventually, he comes to believe in the delusion he has created. It becomes his reason for being, his raison d’etre. Deeper and deeper he becomes convinced in his own ability to perform the impossible. One can see that our hero, sadly mistaken as he is, has every incentive to deny reality when (especially when) it is presented to him facts and all. Tell the alchemist he cannot alter the properties of led and his world, as he knows it, as it comforts him at night, begins to crumble. Likewise for our birdbrained OBGYN. So let the evidence against Mr. Bernanke’s understanding of reality mount. As it will continue to do. We don’t imagine this man, whose entire reputation, whose entire career, rests on a false reality, is going to suddenly about-face anytime soon. He has every incentive to deny the facts, to look the other way. Of course, it’s easy to deny reality. Not so easy, as Ayn Rand once quipped, to deny the consequences of denying reality. They will come due soon enough, Fellow Reckoner…and then, as Bill Bonner likes to say, all the Fed’s horses and all Obama’s men won’t be able to put Mr. Bernanke’s economy back together…ever again. In two related stories in the final weeks of 2011 the WSJ took a couple of shots at gold buyers essentially taunting them as dooms-day conspiracy theorists akin to Ted Kaczynski. They reported on golds performance against T-bills one of the few areas out side of individual stocks that gold actually underperformed. Then followed it up on the last day of the year with another similar story how the Dow tied gold in performance for 2011. All of this is true. While they did gloss over the decade long gains in gold over 540% since 2002. They never made the correlation that this far outperformed the Dow by a factor of 10 & T-bills are barely above record lows. T-bills are still near historic lows reached in the first quarter of 2011. So the real story? Due to declines in the markets over the previous 5 years compounded with the two debt crisis in the US & Europe gold out-perform on an annual basis until this year. Gold will continue to act as liquidity in times of crisis when wall street needs to cover margins & losses. It should also be a portion of a fully diversified portfolio,conservatively 10% to an aggressive %20 of your net portfolio. Even the 1% use gold as financial insurance to cover during the worst of financial crisis’s like they did in 2009. Don’t be caught with out gold protecting your investments & providing much needed liquidity in times of economic trouble. Gold ended last year in violent fashion, dropping 21 percent in less than three months. The sudden move, coming as equities rebounded in December, raised doubts among many investors about the sustainability of a trade that has been a winner for 10 years. But these kinds of moves are simply par for the course, said the long-term gold bulls. It’s just a way of shaking out the weaker and more speculative investors that pile into the metal for a short-term trade, they said. After bottoming on the final day of 2011, gold is back at it again, up five percent in the new year, compared to a 3.9 percent return for the S&P 500 index. Despite the volatile ending, gold finished up 2011 by 10 percent, while the benchmark for U.S. equities was virtually unchanged. Gold fell 8 percent in January 2011. The metal plummeted 12 percent in two weeks at the end of 2009. “Such corrective price movements have been evident throughout the 2001-2011 bull market, especially since the acceleration in the uptrend from 2009,” according to a Morgan Stanley research note to clients Tuesday. 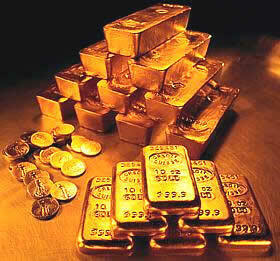 Gold’s drop at the end of the last year also came amid a string of strong domestic economic data. If the economy, and subsequently the stock market, can recover on their own merits through rising employment and capital investment, then that could spell the true end to the gold bull market, investors said. But many bullion bulls doubt that can happen, especially with the European Union now having to print their way out their own financial crisis this year. For the last 10 years, they’ve been right. 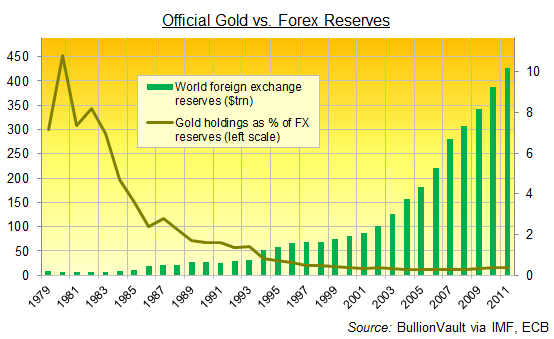 Central banks increased the amount of gold they lent for the first time in a decade in 2011, as they used their bullion reserves to help commercial banks raise US dollars. 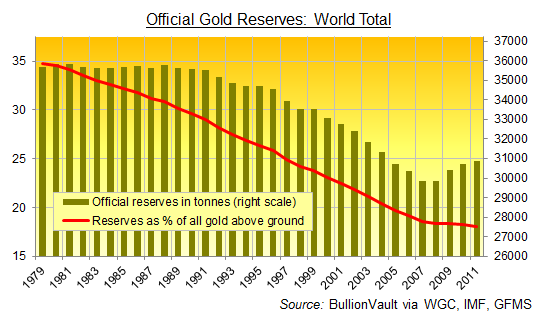 Although central banks hold one-sixth of all the gold [XAU= 1647.66 -3.53 (-0.21%) ] ever mined in their reserves, their activities in the bullion market are opaque, with not a single institution revealing its day-to-day operations. In addition to holding gold for their reserves, some central banks also trade the metal, lending it on the open market in order to obtain a yield. Thomson Reuters GFMS, the precious metal consultancy that publishes benchmark statistics on the gold market, on Tuesday said that the quantity of gold lent by central banks had risen last year for the first time since 2000. The estimate by GFMS confirms a trend that bankers and gold traders have been privately discussing for the past six months. The increase in lending came as eurozone commercial banks, suffering a shortage of dollar liquidity, rushed to borrow gold from central banks and later swap it on the market in exchange for dollars. “There is growing evidence that short-term loans from some central banks to commercial banks could well have increased considerably [in 2011], with the latter then using gold to swap for US dollars,” GFMS said. As the squeeze in the dollar [.DXY 80.65 -0.52 (-0.65%) ] funding markets intensified, short-term interest rates for lending gold fell to record lows in late 2011. The rate for lending gold for one month fell to -0.57 percent in early December, implying that a bank would have to pay to swap it for dollars. The rush among eurozone commercial banks to lend gold was one of the clearest signs of the “dash for cash” late last year that weighed on the bullion price. Goldman Sachs said in a report that “the downward pressure from European bank funding issues has left gold prices at a steep discount to the levels suggested by US [real interest rates]”. The metal tumbled 20 percent from a peak above $1,900 a troy ounce in September to a low of $1,522 in December. On Tuesday, gold was trading at a five-week peak of $1,663. The increase in gold lending by central banks has brought an end to a decade-long decline in the amount of bullion out on loan, as falls in hedging by gold miners reduced demand to borrow the metal. GFMS did not put a number on the increase last year, saying only that lending had risen “by a small amount”. It estimates that the outstanding volume of swapped or leased gold stood at 700 tonnes at the end of 2010, down from a peak of about 5,000 tonnes in 2000. Philip Klapwijk, head of metals analytics at the consultancy, was skeptical that the lending activity had affected the gold price. “This is a purely financial swap of gold for US dollars; it shouldn’t have an impact on price,” he said. 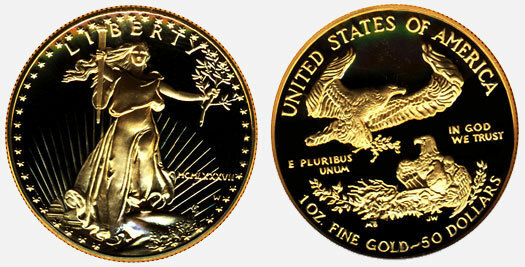 Nonetheless, GFMS maintained a cautious outlook for gold prices in the near term, predicting that the metal would average $1,640 in the first half of 2012. All the same, GFMS predicted that gold prices would once again gather steam later this year, touching a peak “just over the $2,000 mark” in late 2012 or early 2013. 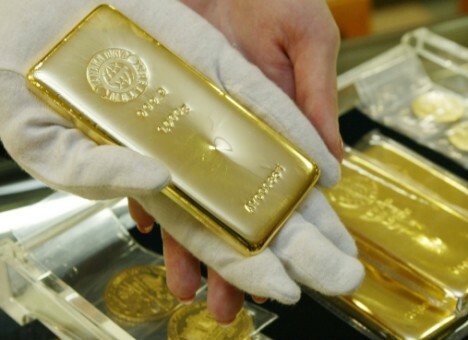 Gold is investors’ favorite asset for 2012, and developed markets are preferred over emerging markets when it comes to putting money in stocks or bonds, according to a poll carried out by Japanese investment bank Nomura. Of the 164 investors who took part in Nomura’s poll, 19.5 percent said they would choose to buy gold and hold it until the end of the year. Other favored assets were stocks and investment-grade corporate bonds in developed markets, with about 13 percent of responses. Emerging market stocks came next, getting about 10 percent of the votes, on a par with developed markets’ sovereign bonds. On the foreign exchange front, more than 40 percent said they would be long the US dollar [.DXY 81.39 0.58 (+0.72%) ] this year, followed by about 14 percent who said they would be long the Chinese yuan [CNY=X 6.3149 0.0008 (+0.01%) ] and a little over 10 percent who would be long the Japanese yen [JPY=X 76.94 0.10 (+0.13%) ]. Around 10 percent said they would be long other currencies, and “the vast majority” were looking to be long the Norwegian krone [NOK=X 6.025 0.0368 (+0.61%) ], the Swedish krona [SEK=X 6.9367 0.0414 (+0.6%) ] or the Canadian dollar [CAD=X 1.0189 0.0027 (+0.27%) ], according to the poll. Around 60 percent of the respondents said one or more countries will leave the euro currency in 2012, with a majority of them believing that only Greece, and no other country, will leave the currency. February, March, April and May were mentioned as months in which investors see yield spreads for bonds of periphery euro zone countries reaching their peak versus Bund yields, according to the survey. The most popular choice for investors was March, with nearly 20 percent of the votes, followed by April, with around 16 percent and February and May with more than 10 percent. For 10-year US Treasurys, respondents on average predicted a yield of 2.21 percent for the end of the year, a bit higher than the current one, which is hovering around 1.98 percent. Asked whether the Federal Reserve is likely to embark upon a third round of quantitative easing, two-thirds said that the Fed will do so, but most see it as an event for the second or third quarter rather than sooner, the poll showed. The traditional, institutional analysts will say, “I don’t understand gold. Why would anyone buy gold?” You have to understand the motivation: an investment in gold is long term. It locks up the money. 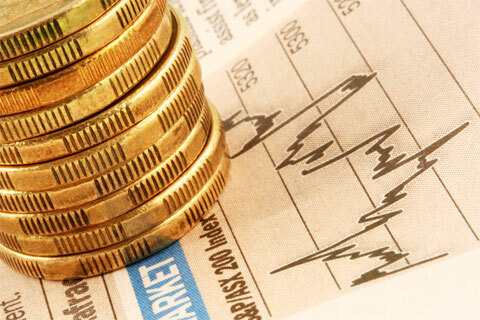 The commission or management fee is much better for stocks that are traded. Many analysts have an axe to grind. Every correction in gold is usually pronounced as the start of the “big gold bear market.” We have disagreed with that for the past 10 years. In fact, the most recent correction even turned many of the bulls bearish, while our technical indicators gave positive buy signals. “The debt problems facing advanced economies are even worse than we thought. “The basic facts are that combined debt in the rich club has risen from 165pc of GDP thirty years ago to 310pc today, led by Japan at 456pc and Portugal at 363pc. In my opinion, the compounding interest on this debt is even more ominous than the actual level. There is no way that this debt will ever be reduced. Remember, much of this debt was accumulated during the boom years when tax receipts were very high. Now we will be in long period of stagnation or worse, possibly lasting 10-15 years or until the next big war. That means tax revenues will be on a long-term decline even as tax rates rise. The debt levels will grow exponentially. 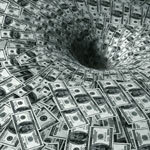 Trillions of sovereign debt, private debt, and bank debt have to be refinanced. Where will that money come from? The printing press, or with today’s technology, “cyber-money.” There is no other way out. And that will make gold the only true money that will hold its value. Sometime in the future, there could actually be a gold shortage. This is not unrealistic. All the major mining companies say that it is becoming very difficult to find new deposits. CNBC had a great report on the South African mines. They sent one of their top people, Bob Pisani, to do a report. He went 2 km down into a mine where the air-conditioned temperature is 100° F. Without air conditioning, it would be 130°. It was a fascinating report about the mining, refining, and then the ETFs. Some of the South African mines are as deep as 4 km. Gold mines in other parts of the world, like Latin America, are facing dangers of being expropriated by their local governments. That dampens the enthusiasm of foreign mining firms to invest huge sums in new mines. It takes up to 10 years to get a new mine into production. If you are ever tempted to go into one of the penny stock gold exploration firms, just ask them, where will they get the tens of millions of dollars required to go into production? In the meantime, the gold purchases by people in India and China are soaring. These two countries are 52% of all gold demand right now, vs. just 25% a few years ago. And in the western world, the gold-holdings of the ETFs are locking up gold supplies. 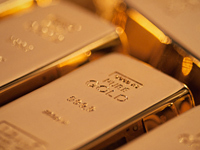 For example, the SPDR Gold Shares (GLD) now holds 1,200 tons of gold, stored in England. The more the buying of GLD and other ETFs increases, the more gold will be taken off of the market, i.e., the shortages increase. Secured storage facilities are running out of space. New facilities are hurriedly being built. We are now at the point in the long term cycle where institutions are just starting to consider gold an “investable” asset worthy of their portfolios. All the other areas of the stock markets are no so closely correlated that it doesn’t matter which sector you hold. We are still in the earlier phases of the gold bull market. In 1981, my firm predicted a 20-year bear market in gold (bottom in 2001) and then said that this would be followed by a 30-year bull market according to our cycle studies. The start of the current gold bull market was in 2001, exactly 20 years later. If my 30-year bull market cycle comes true, then there is quite a bit of excitement still ahead. What could possibly cause that? In 1981 when we made the 30 year bull market forecast, we said we didn’t know what would cause it. Now we know: unprecedented and unsustainable debt levels of governments around the globe and a threatened implosion of the debt pyramids. The power of compounding of governmental debt alone will continue to increase that debt. It will require ever more money-creation just to service the debt. Taxes alone cannot do it. Big tax hikes will only worsen the debt problem. Compound­ing at any rate, even at 1%, is unsustainable over time. Just try it on your HP calculator. You are currently browsing the Mind Your Money blog archives for January, 2012.